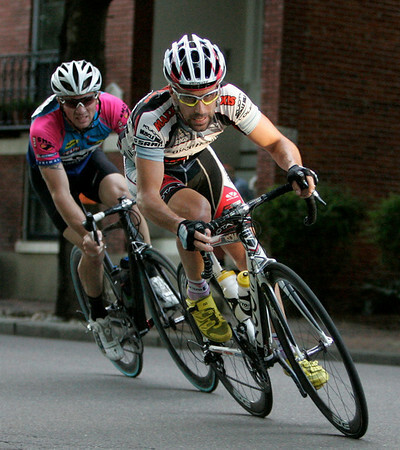 Tim Johnson, of Beverly, Mass., rounds a corner towards the end of the elite men's Witches Cup bicycle race in Salem. Johnson came in fifth among the field of 95 competitors. Photo by Mary Catherine Adams/Salem News. , Tim Johnson, of Beverly, Mass., rounds a corner towards the end of the elite men's Witches Cup bicycle race in Salem. Johnson came in fifth among the field of 95 competitors. Photo by Mary Catherine Adams/Salem News.